Colleagues and constituents paid tribute to the independent Blaenau Gwent MP and AM Peter Law at his funeral on Thursday. Before the church service in Ebbw Vale, an hour-long procession was held through the constituency, with hundreds of people lining the streets. 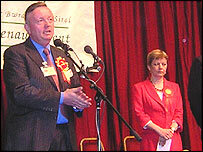 He caused a political storm at the last general election in May 2005, overturning a 19,000 Labour majority. Mr Law decided to turn his back on his own party after a row over the imposition of an all women shortlist. 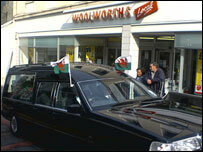 The funeral cortege travelled through Abertillery, Nantyglo, Brynmawr and Tredegar before the service. Among those lining the streets of Abertillery was Joy Kelly, 72, from Six Bells. She said: "I liked him as a person. We'd go into the cafe and whenever he was down in town he'd come in and say hello. "If people were not well he'd make a point of asking where they were. "Politics aside, I thought he was a very nice man. There are not many gentlemen left." Shop owner Janice Taylor, 55, from Nantyglo, who was visibly upset, said: "I've known Peter since I was about 14 so it is a personal thing. "He was a really good person and he never treated anybody any differently." A public address system was set up outside at Christ Church in Ebbw Vale. Tributes with the coffin included the letters "AM" and "MP" spelt out in flowers. Mr Law's predecessor as MP, Llew Smith paid tribute to Mr Law at the service. 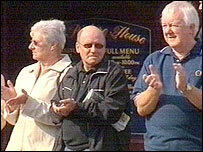 Mr Smith, one of the pall bearers, said his friend "loved life" and "wanted to do good for people". "Friends of ours said of Peter, when you are in his company, no matter what position he held, he always made you feel important," he said. "He always seemed to be full of life." At the family's request, singers Sian Jones, Heather Jones and Sioned Mair sang the Welsh lullaby Cwsg Osian for "a man who loved his country above all else". The Rector of Ebbw Vale, the Rev Geoff Waggett, described how Mr Law dramatically re-entered the general election race after surgery. "He had a miraculous healing and a miraculous election," he said. Assembly presiding officer Dafydd Elis Thomas and his deputy Dr John Marek attended the funeral, as well as First Minister Rhodri Morgan. The Welsh Secretary Peter Hain was attending a family funeral and was represented by former Wales Office Minister and Islywn MP Don Touhig. Mr Law started as a grocer and became a local councillor at the age of 22, rising to the position of Blaenau Gwent council leader. He was elected assembly member in 1999 and served in Alun Michael's cabinet as environment and local government secretary, before being sacked by Rhodri Morgan in a reshuffle in 2000. Mr Law's widow has said she is considering standing against Labour for her late husband's seat to carry on his legacy in Blaenau Gwent.